There was no scientific malpractice at the University of East Anglia’s Climatic Research Unit, which was at the centre of the “Climategate” affair. This is according to an independent panel chaired by Lord Oxburgh, which was convened to examine the research published by the unit. it seems that some of these criticisms show a rather selective and uncharitable approach to information made available by CRU. They seem also to reflect a lack of awareness of the ongoing and dynamic nature of chronologies, and of the difficult circumstances under which university research is sometimes conducted. That much should be obvious to anyone who’s looked beyond the notoriously bad reporting on this issue. For those keeping score, this is the third investigation to conclude that the denier claims are baseless. Which was what James Annan noted when the inquiry by the British house of commons science and technology committee asked for more transparency. It is the government’s own policies that stifle the openness and transparency the government claims to want. A host of important unresolved questions also arises from the application of Freedom of Information legislation in an academic context. We agree with the CRU view that the authority for releasing unpublished raw data to third parties should stay with those who collected it. Most of the CRU data has been publicly available for years. As for the small percentage that wasn’t available (like Environment Canada data) CRU didn’t have the authority to release it. No amount of FOI requests change that basic fact. There is, of course, something to be gained by subjecting the statistical methods of climatologists to more rigorous scrutiny, but expecting this scrutiny to cause drastic changes to our understanding of the climate system is absurd. As are the claims from deniers that this somehow justifies their behaviour. Perhaps most amusing is watching deniers claim that these inquiries, which they previously trumpeted, are all part of the global warming conspiracy. Deniers are not happy, but that was a forgone conclusion. 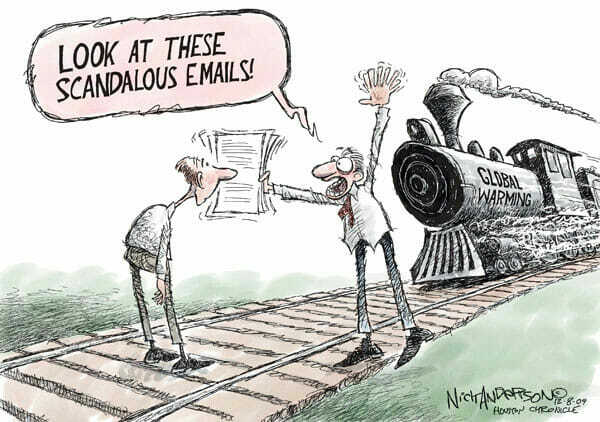 Anything less than proof that Phil Jones and CRU manipulated the data and that man-made climate change is a myth and a fraud was guaranteed to make deniers unhappy. That is why we call them deniers. RON OXBURGH, breezily pushing his bicycle through a clot of journalists outside the press briefing he had just given, is a busy man happy to hurry. Of course had he driven to the press conference the deniers would be all over him because, by driving he is indicating clearly that does not believe in the validity of the global warming or the science coming from CRU. Instead he is just paying lip service to it in order avoid angering the secret world government that is orchestrating the massive conspiracy. Damned if you do, damned if you don’t. Denialism at its finest! Professor David Hand said that the research – led by US scientist Michael Mann – would have shown less dramatic results if more reliable techniques had been used to analyse the data. He said the graph, that showed global temperature records going back 1,000 years, was exaggerated – although any reproduction using improved techniques is likely to also show a sharp rise in global warming. He agreed the graph would be more like a field hockey stick than the ice hockey blade it was originally compared to. Another denier talking point shot down, (not that they ever cared about things like that). This makes sense of course; Mann’s hockey stick has been replicated over 10 times by different groups using different data, and different techniques. A NAS report into the hockey stick concluded that it’s conclusion was correct. And contrary to the denier claims, It is the blade in which we have most confidence because it is during that time period where we have good direct measurement of temperatures. And even if the hockey sticks (remember there are over 10 of them) are somehow shown to all be false, it still doesn’t mean a damn thing in regards to global arming.